Mother’s name: Fatimah (daughter of the Holy Prophet). Death: Martyred in Karbala’ (Iraq) at the age of 57, on Friday, 10th Muharram 61 AH and buried there. In the house of the Holy Prophet, which presented the best image of both the worlds – the heaven and the earth – a child who benefited humanity as if he was a Divine Impression reflecting the earth, was born on one of the nights of the month of Sha’ban. His father was Imam Ali, the best model of kindness towards his friends and the bravest against the enemies of Islam, and his mother was Hadhrat Fatimah, the only daughter and child of the Holy Prophet, who had as universally acknowledged, inherited the qualities of her father. Imam Husayn, is the third Apostolic Imam. When the good news of his birth reached the Holy Prophet, he came to his daughter’s house, took the newly-born child in his arms, recited Adhan and Iqamah in his right and left ears respectively, and on the 7th day of his birth, after performing the rites of aqiqah, named him al-Husayn, in compliance with Allah’s command. ‘Abdullah ibn Abbas relates: “On the very day when Imam Husayn was born, Allah ordered angel Gabriel to descend and congratulate the Holy Prophet on His Behalf and on his own. While descending, Gabriel passed over and island where the angel Futrus had been banished due to his delay in executing a commission assigned by Allah. He was deprived of his wings and expelled to the island where he remained for several years praying and worshipping Allah and asking for His forgiveness. Hasan and Husayn, the two sons of the Holy Imam Ali ibn Abi Talib and Hadhrat Fatimah, our Lady of Light, were respected and revered as the ‘Leaders if the Youths of Paradise’ as stated by the Holy Prophet. The Holy Prophet Muhammad, peace be on him and his progeny, had openly prophesied tht the faith of Islam would be rescued by his second grandson Husayn, when Yazid, son of Mu’awiyah, would endeavour to destroy it. 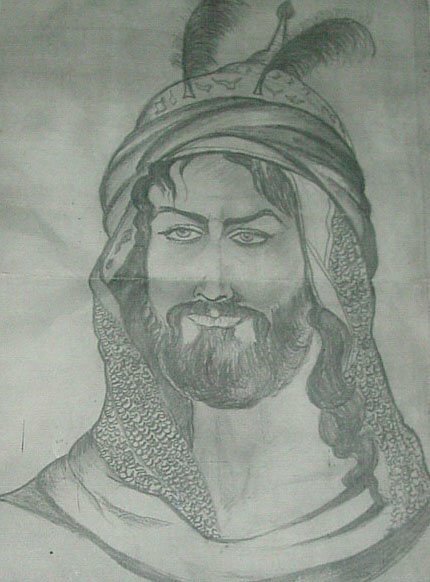 Yazid was known for his devilish character and brutish conduct. He was known as the most licentious of men. The people having known and understood the character of Yazid, formed a covenant by which Mu’awiyah could not appoint Yazid as his successor. This undertaking was given by Mu’awiyah to Imam Hasan from whom Mu’awiyah had snatched power. Mu’awiyah violated this undertaking and nominated Yazid who succeeded his father. Immediately as he came to power, Yazid began acting in full accordance with his known character. He started interfering in the fundamentals of the faith and, practised every vice and wickedness freely with the highest degree of impunity and yet held himself out as the successor of the Holy Prophet, demanding allegiance to himself as the leading guide of the faith. Paying allegiance to Yazid was nothing short of acknowledging the devil as God. if a divine personality like the Holy Imam Husayn had agreed to his authority, it would be actually recommending the devil to humanity in place of God. Yazid demanded allegiance from the Holy Imam Husayn, who could have never agreed to it at any cost. The people fearing death and destruction at the hands of the tyrant had yielded to him out of fear. Imam Husayn said tht come whatever may, he would never yield to the devil in place of God and undo what his grandfather, the Holy Prophet had established. The refusal of the Holy Imam to pay allegiance to this fiend, marked the start of the persecution of the Holy Imam. As a result he had retired to Medina where he led a secluded life. Even here he was not allowed to live in peace, and was forced to seek refuge in Mecca where also he was badly harassed, and Yazid plotted to murder him in the very precincts of the great sanctuary of Ka’bah. In order to safeguard the great sanctuary, Imam Husayn decided to leave Mecca for Kufa just a day before the Hajj Pilgrimage. When asked the reason for the mysterious departure from Mecca foregoing the pilgrimage which was only the next day, Imam Husayn said tht he would perform his year’s pilgrimage at Karbala’, offering the sacrifice not of any animals, but of his kith and kin and some faithful friends. He enumerated the names of his kith and kin who would lay down their lives with him in the great sacrifice at Karbala’. On the 7th of Muharram water supply to the Imam’s camp was cut and the torture of thirst and hunger started. The Holy Imam’s camp consisted of ladies, innocent children including babies and some male members of the Holy Prophet’s family; along with a small band of some faithful friends of Imam Husayn who had chosen to die with the Holy Imam, fighting against the devil for the cause of Allah. Shabe Bara’at is the night that Allah (SWT) closes our previous book and plans all the happenings to take place for the year to come. So, I ask you to forgive me for anything said or done as I do not know what is going to be written in my destiny for the upcoming year. No man or woman on earth knows when they will leave this world…It could be any moment, and fast and unexpected…. Death might come while I perhaps have hurt my brothers and sisters. Please Forgive me for the countless harm I may have caused intentionally or unintentionally. And may Allah (SWT) forgive us all, grant us and all our marhoomeen an opportunity to serve with our living Imam. May Allah (SWT) hasten the reappearance of our Holy 12th Imam (ATFS) and give us the tawfeeq to do right. Let us keep each other in duas as we are all so mohtaaj of these. Imam Jaffer Sadiq(a.s.) reports that Prophet Mohammad(saww) has said that “Sha’baan is my month and Ramadhan is the month of Allah(swt). Imam Ali Reza(a.s.) has said that If someone observes fast during the last three days of Sha’baan and combines them with the fasting during the month of Ramadhan then Allah(swt) will grant him/her the sawab of two months of continuous fasting . It is, therefore, highly advisable to fast in the last three days of Sha’baan to become eligible for this great Sawab. May Allah swt help, assist and guide all of us to attain the maximum benefit during this Holy Month. Who knows who will be here next year and who will have left for his/her final journey!!!!! 1). Sustenance, 2). Life and death and 3). Welfare of the people. Next to the “Night of Qadr” the Night of 15th Sha’baan is the most auspicious night (also known as “Night of Bara’at”). According to the Imam Muhammad bin Ali Al Baqir (a.s.) and Jaa’far bin Muhammad As Sadiq (a.s.), the Almighty Allah has promised to fulfil every legitimate desire put forward to Him tonight. During this night Allah (swt) bestows on HIS people from HIS bounty & forgives them out of HIS grace & generosity. Of the blessings of this night is that, at the dawn of this night, was born the Leader of the Time Imam e Zamana (atfs) in Samarra -Iraq in the yr 255 AH . Almighty Allah has chosen this night for the Ahl al-Bayt a.s., in the same way as He has chosen the Qadr Night for our Prophet—peace be upon him and his Family. Ahadith in the book IqbalulA‘mal – Hadhrat Jibreel visiting the Prophet (s.a.w.w.) said: "Therefore, stay awake this night in prayer and worship and encourage your Ummah to also keep awake this night in order to get closer to Allah swt. I have come to you while all the Angels in the Heavens are together with one another some are glorifying Allah, others are in Ruku‘, others are in the state of Sujud while others are busy in the Dhikr of Allah". 1). This is a night in which not a single person supplicates to Allah except that his prayers are accepted. 2). Nobody asks for a single thing on this night except that it will be given to him. 3). No one asks Allah for forgiveness except that his sins are wiped out. 4). No one turns in repentance to Allah except that He accepts their repentance. 5). Whoever is deprived of the goodness of this night has definitely been deprived of something great. 4). Tomorrow the Day of Judgment will take place. a) Waiting is not a passive situation. It requires efforts & actions to bring about changes on both personal & social fronts. b) The Reappearance is also dependent upon the conditions of supporters & the society. The leader also awaits the availability of followers who will instantly obey w/o hesitation & questioning. e) Many recent events point to the fact that the reappearance is very close. Many Hadith also point out that, at the end of time it will be easier to hold burning coal in bare hands than to keep ones faith intact. f) Reappearance will finally take place, with or without participation from us, the question each one of us has to answer is; what is our role & responsibility today in the scheme of things. a) Calling Imam Hussain (as) by the people of Kufa. The people were aware who is the just leader & even their hearts were for the Imam, YET when the time for support arrived they were not prepared for consequences & take personal losses. They did not sufficiently change themselves to be prepared for sacrifices required to follow him. They expected the Imam to come & change situation/solve problems rather than attempting/preparing for it first. They even welcomed the wrong leader in disguise, assuming him to be the Imam, due to lack of marefat. b) Calling the Prophet (saws) by the people of Medina. The prophet received invitations from Medina, but accepted it only when there was sufficient evidence of the people having changed themselves sufficiently to bear the consequences of his arrival. History then proved how the people supported him in the mission. a) Azazeel: There was a cry in the skies that one of the pious worshippers would be one of the most cursed ones. All the creatures, at all stations were worried that it could be them & went to the creation, next higher in station, to seek his intercession by prayer. Only Azazeel was confident & prayed for all, except himself & as a result was the cursed Satan.! b) Servant of Mamoon: She loved the Imam & Mamoon sent her to the Imams house for work. The conditions of Imams house were very different from Mamoon’s luxuries & the servant maid could not get used to the perceived difficulty of getting up for prayer each morning etc, which ultimately led her to seek to go away from the Imams servitude. c) Balam e baoor: He had a high status & his duas were accepted instantly. He was asked to pray for victory against Prophet Musa (as), which he finally attempted, due to the riches offered to him. We easily condemn the people mentioned in Sura Juma, who left the Prophet in prayer for entertainment & business deals. We need to apply it to ourselves first & check if we too have similar habits of giving priority to these matters over Islam. We are required to continually recite “Ihdinis siratal Mustaqim” i.e. keep us on the right path, at least 17 times in a day, because there is a danger of deviating & being misled. a) Our Homes should show preparedness to welcome the Imam. They should be Islamic homes devoid of all things/situations, which lead to sins. If we are not prepared to give up sins; shaving beards, listening to haram music, not wearing hijab etc for Islam, we may not be able to follow the Imam on his reappearance. Attention to Islamic education of our children is very important. In our pursuit of wealth and/or over emphasis on academics, the children’s upbringing (tarbiyat) suffers causing our children to deviate. b) Imam Hussain (as) in his last address on 10th Muharrum addressed his opponents by saying that they were unable to recognize the right path due to the Haram rizq in their stomach. c) Zulqarnain required the affected community to participate in efforts, which he directed. He used modern technology of mixing metals, to create a barrier between Gog & Magog & the troubled community. Time & energy is/ will be required to be spent for the cause of Islam by the community & only providing money will not be sufficient as the verses of Sura kahf narrating this event explain. Acquisition of the latest Technology is also required for salvation, even when the leader reappears to help. But technology without the control of the conscience is disastrous to humanity. d) Implementation of the complete Shariah in society will be the main objective on reappearance & people who have complete knowledge of Islamic rules will be required. We need to learn & know more of the Islamic Rules. Download some of these from www.islamic-laws.com. Ziarat Arbaeen describes the purpose of Imam Hussain (as) jihad as ‘taking people out of Ignorance’. Acquisition of Knowledge is therefore very important. We do our best, but each one of us has different capacities, yet must remain connected to the source i.e. Marjas rather than remain isolated containers of the limited knowledge we can gather. We are warned, through a dream of Jabir, of a piece of cloth being torn in parts. The Prophet explained this dream that at the end of time, people will take only parts of Islam to suit themselves, which will benefit no one. This will also give a bad image to Islam like a torn cloth. We need to accept the whole of Islam with all its rules & not only the parts that suit us/ our method of thinking, irrespective of our ability to understand the complete reasons/logic for the rules. f) We need to go behind events taking place & analyse the depths, rather than take them at face value. This skill requires to be developed for correct analysis & recognition of the plans of the enemy. g) We need to be aware of the attacks on us & protect the 3 corner stones institutions of Shia Islam i.e. Azadari, Marjaiyyat & the Belief in our Imam. 1) Azadari: The attacks are from 2 sources i.) Certain practices, which contradict Shari at i.e. Aspects, like women w/o hijab; Letting Salaat become qaza etc,is used by adversaries to mention that azadari itself is not ok as it results in these things. ii.) Use of so called ‘intellectual’ arguments to say, what is the need for Alam a wooden stick & Tazia & why beat chest etc. This is done to deviate us from practicing & keeping Azadari alive. Azadari is a source of spiritual strength. (ii.) Creation of Conflict between followers of different Maraje. 3) False Mahdi’s introduced like creation of Bahai & Ahmadia & Wahabi isms. We must watch & evaluate any claims rather than rush to accept any claim of being mahdi even if he can demonstrate some miracle like acts (using technology probably). Historically tyrants have used 2 methods to silence/mislead people; the sword to make them fearful & money to buy peoples loyalties. Sufyani & Dajjal are symbolic for these at the time of Imams return. The sword has not been effective in eliminating the true believers, but apparent attractions & enticements have resulted in many deviations of true believers. Keeping wants & desires in check will help in not getting carried away by material pleasures offered & the apparent “heaven” which will actually be Hell as shown by Dajjal. Dajjal could be a symbolic of a system of government based only on material progress & NGO’s apparent beneficent aims having hidden agendas. Or it could be governments, individuals & even an entertainment system like Cable TV, which takes us away from HIS rules. One eyed in the sense that it will only consider material aspects, completely ignoring spirituality. There are other Haidth, which continue after the famous “ Antenna” Hadith, related to Salman E Farsi. It mentions about using a mirror like gadget for security (possibly CCtv ) & a gadget for visually communicating with people close & far (possibly the mobile gsm ) at the time of Reappearance. State of momins is that they are not prepared, ie involved in sins, not following Sharia. However their Iman / Faith is in tact. Sins can get forgiven & momins can achieve salvation despite all the problems they face in the material world. After Reappearance, not following the Imam unconditionally, will mean a fault in beliefs (Iman) & hence it is possible many "momins" may lose their faith itself. & Hence lose salvation. Our Imam is concerned for Momins & prefers to wait & give additional opportunity to Momins to reform themselves & be prepared. This delay does cause additional hardship to Momins & their lives/ property / honour is more & more in danger with the passing of time. There is a Story of Ayt Khoie’ s father who saw a house in Hilla which is a mosque/imambara/ house / shrine all in one. The background is that the resident of the house was a true follower of Imam & on a specific day Imam informed him to call all believers to his home. At this event, goats were used to spill blood from the terrace, which scared the believers into fleeing the place. This demonstrated that momins were not prepared to sacrifice for Imam, but were calling without preparation & commitment of unconditional adherence to his commands. Perhaps this incident conveys why our 12th Imam (AJ) has still not come out of his concealment. It is easy for us to call on him but we must also ask ourselves how many of us are sincere in what we say? How many of us are prepared for his arrival? And how many of us lead a lifestyle, which is in conformity to his teachings? It is expected that there will be many false Mahdi’s who will appear before the true Mahdi (atfs). We presently observe many people who claim that Imam meets them regularly. These are all fraudsters. Current technology also makes it possible to show the apparent ‘miracles’ if someone does not have sufficient knowledge of science. There is a wrong notion that we have to immediately rush to our Imam upon hearing a call. This is only true for those who can & will recognize that it’s the Imams call through own knowledge/deduction. Others need to wait & verify the claim especially thru the Maraje who have the means to guide us. Salman e Farsi who had waited for 200 years for the Prophet to appear, took 3 consecutive weeks of action & meetings before confirming the Prophet hood with the signs he had. b) Expecting a favourable status compared to others (esp. apparently non-believers/followers) & not receiving the same. A superiority complex. Duas have a very important role but have to be accompanied by actions. Prophet Abraham’s wife Hagar undertook the ‘action’ of Saaee between Safa & Marwa & prayed to Allah swt & hence the prayer was answered in a way, that she asked for a cupful of water & got in return Zam Zam for all times ! We have to take the required action & leave the rest to HIS will. Allama Hilli commenced copying a very big book at dusk, though it was an impossible task to do it by dawn & return the book to its owner as required. His job was to start the work & with the Imams help the work was accomplished! The opponents /enemy may appear very strong, & impossible to defeat, but this should not lead to despair. It should lead us to redouble our efforts instead with the resources at our disposal. There are examples in History where the impossible became a reality in a very short period of time. Eg Bilal would have been very happy at being able to practice Islam himself without prosecution, in Mecca, but could never have imagined that he would be reciting the Azan from top of the Kaaba within a few years! It will require participation from all young old, men & women & children, just as Kerbala required all participants. It will not be sufficient to be observers, as was the case of say Khandaq or other wars at the time of the Prophet (saws). Our Imam is in waiting for over 1170 years & has been perfectly worshipping the Almighty for these years. There are countless events of his meetings/assistance & presentation of our deeds to him. Each of us is required to act in our own way to hasten the reappearance. May Allah swt keep us guided, hasten his reappearance & make us amongst his followers. 7) Recite Munajat e Shabaniyah with presence of heart.